1. Can a legal heir transfer the ITC to a new entity in case of death of sole proprietor? 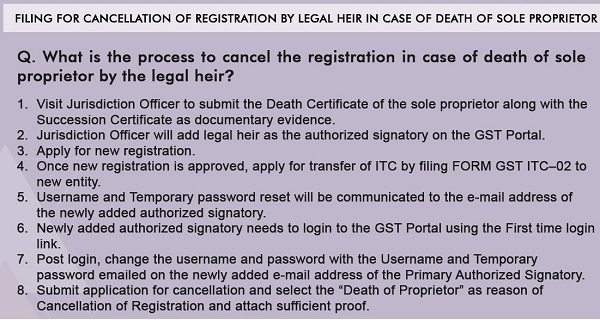 Yes, a legal heir can transfer the ITC to a new entity in case of death of sole proprietor. In such a case, legal heir needs to get a new registration under GST and transfer the ITC through FORM GST ITC-02 to this new entity. 2. What is the process to cancel the GST registration in case of death of sole proprietor? How can a legal heir transfer the ITC to a new entity in case of death of sole proprietor? 1. In case of death of sole proprietor, Legal heir has to visit office of the Proper Officer (Jurisdiction Officer) and submit the Death Certificate of the sole proprietor along with the Succession Certificate before the Proper Officer as documentary evidence. 2. Proper Officer will add legal heir as the authorized signatory on the GST Portal. In case the successor is minor, he cannot be added as an authorized signatory. In such cases, minor successor needs to be represented by his legal/ natural / testamentary (appointed by will) guardian. The legal guardian needs to be appointed or nominated by the competent authority (Normally District Judge). Legal guardian can take decisions on behalf of minor legal heir/ successor and he can also appoint authorized signatory for this purpose. 3. Legal heir has to apply for new registration. 4. Once the new registration is approved, Legal heir has to apply for the transfer of ITC by filing FORM GST ITC–02 to new entity. However, there is no restriction on filing of ITC-02 pre or post cancellation. It is an independent form and has no relation with cancellation of the sole proprietorship firm. 5. Username and Temporary password reset will be communicated to the e-mail address of the newly added authorized signatory as entered by the Tax Officer in your jurisdiction. Next, the newly added authorized signatory need to login to the GST Portal available at https://www.gst.gov.in/ and login using the First time login link. He/ She will be forced to change your username and password after first time login with the Username and Temporary password that was emailed on the newly added e-mail address of the Primary Authorized Signatory. 6. Legal heir or his/ her authorized signatory has to submit the application for cancellation and select the “Death of Proprietor” as reason of Cancellation of Registration and attach sufficient proof. IF the sole proprietor has died and there are some payments that needs to be collected from market, GST number is needed to get those but GST is now inactive. HOw to activate GST to get those payments ? business will not be continued after that. also is there a option to succession certificate here? Agar proprietor ki death ho gayi hai aur woh firm compounding methi aur . Ek nahi firm legal hair Nicole Liye aur new Vali bhi compounding Mein Hai tab purani wali firms stock new wali Mein Kaise transfer Karenge tab ITC 02 Bhara nahi Jayega please reply me full procedure thank you sir. please give me notification no or Section or Rule……….??? Getting a Sucession certificate takes a lot of time and is not an easy process. An Affidavit stating the name(s) of legal heirs would be sufficient.